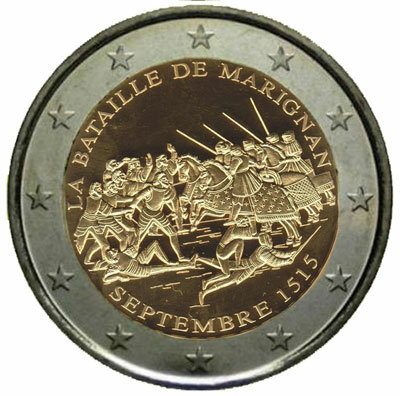 It has been alleged by some in mainstream news that the French Government has cancelled plans to issue a proposed €2 commemorative coin which was to mark the 500th anniversary of the battle of Marignan, in the wake of strong French opposition who made their feelings well known about Belgian plans to issue a commemorative €2 marking the bicentenary anniversary of the battle of Waterloo. The 200th anniversary is to be marked later on this year when Anglo – Prussian – Dutch forces defeated the armies of Napoleon at Waterloo, what is today in Belgian territory. The controversy began when, as part of the application process of any Euro-zone government who wishes to issue a commemorative circulation coin, namely the €2 denomination, was filed by the Belgian Government. Permission must be given by the European Commission which consider the subject, the design and if there are any objections from any other fellow Euro-zone member state. In this case, there was indeed opposition when France stated that at a time when the euro-zone needed unity, Waterloo was a reminder of belligerent times and, as such, they opposed its issue. Unfortunately, the Royal Belgian Mint had already produced 175,000 for distribution which would not only have legal tender status in Belgium, but throughout the Euro-zone of 19 member states. There have been hints that the coins may still be distributed but as collector coins with limited legal tender status only within Belgium. The Battle of Marignan, which occurred in September 1515 when French and Venetian forces beat a Swiss-Milanese army, resulting in between 10,000 and 20,000 dead and wounded. Now, although Switzerland, a land-locked country sandwiched between France and Italy is neither a member of the European Union nor of the Euro-zone, parallels were pointed out between the anniversary of Waterloo and that of the Battle of Marignan, where not only many fatalities occurred but between countries which are now friendly towards other – in the case of Venice, it is now part of the Italian Republic. It is likely that France would have opened itself up to accusations of hypocrisy and a “double standard” had the coin proceeded to production. As Europe nears the anniversary this June, it has been confirmed that there will be national celebrations in Belgium which will commemorate a battle that had changed the tide of European fortunes as much of the continent had been either under the direct rule of the French Emperor or ruled by many of the satellite states he had set up, many headed by several members of his family. The European Commission allows for each Euro-zone member state to issue up to two commemorative €2 coins annually, though several countries have not done so, several other countries have embarked on many commemoratives, marking national anniversaries, political figures and landmarks, some of the coins on offer this year will be a €2 from Germany celebrating the 25th anniversary of German unity, a €2 from Italy issued for the EXPO 2015 held in Milan and a €2 coin from Finland celebrating the birth of Jean Sibelius, composer of their national anthem. If France should ban Battle of Marignan commemorative coin. They should ban Charlie Hebdo instead? I don’t think its that the Finance Ministry or Mint BANNED this coin per-say, I think they might have been concerned that they might be accused of hypocrisy – that is, objecting to a kind of coin that they themselves went ahead with – a coin marking an anniversary of victory over a fellow European Union member such as Italy since Venice, was one of those countries who took part in the battle and which were defeated by France. We’ll have to see how this process continues in the face of further anniversaries in Europe about both world wars and what if any subjects are included on commemorative coins but, with this subject spanning over two centuries, the restrictions list may indeed lengthen.